Pigs in blankets are chipolata sausages, usually made from pork and the ‘blanket’ is made from bacon. Both pork and bacon come from pigs. Specially Selected Pork is the brand representing product from the Quality Meat Scotland Assurance Scheme and around 95% of pigs in Scotland are covered by the scheme. Specially Selected Pork is sourced from farms with high levels of animal health and welfare and implement modern professional farming practices. Check the label on the chipolata sausages you buy. You are looking for a high % of meat which will provide you with a good sausage. Cheaper sausages often have low meat content and are filled out with rusk and other ingredients. 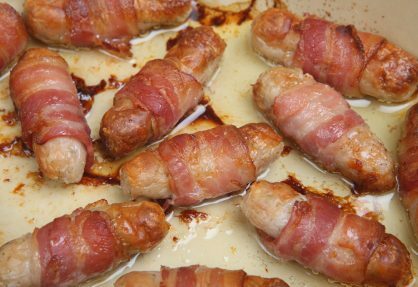 You can use leftover sausage meat or stuffing and wrap it in bacon to make your own pigs in blankets. Look for the Specially Selected Pork logo. This means the meat has come from pigs born, reared and slaughtered in Scotland. As usual, your Glow email will get you into the Good Food Yammer chat!